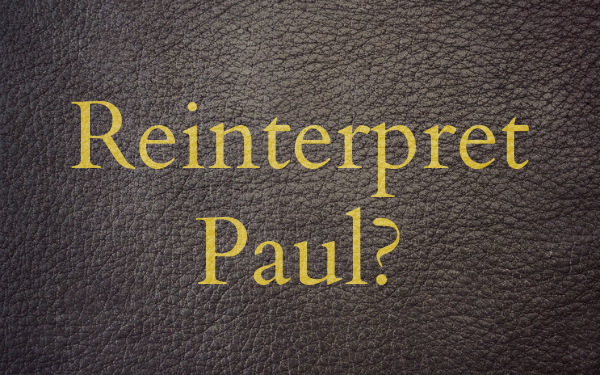 is there a need to reinterpret Paul? Our intention is to take a look at some of the works of E. P. Sanders and James D.G. Dunn and to evaluate the so-called “New Perspective on Paul”; the bearing of this discussion upon the task of ministers and the life of the churches will also be discussed. The subject that I am addressing here is one that has been called nothing less than “the revolution that has rocked NT studies.” Anyone who reads scholarly works on Paul especially will encounter the effects of this “revolution” frequently. It will impact our reading, our preaching, and much of our approach towards the New Testament. It is today at the forefront of many a debate in the whole field of NT studies. The so-called “New Perspective on Paul” surfaces time and again. The effects of these scholarly debates even seem to have surfaced in an “Open Letter” published in the midst of our churches in southern BC last week. For sometime now, I have had my own suspicions about the matter, but one of the benefits of teaching for a while at the seminary is that I have been able to spend some time delving into the matter. At the same time, I should mention that there has been a tremendous amount written on this subject and I certainly do not consider this presentation to be exhaustive. For an excellent review of the history of the whole debate, one should consult the first chapter of Frank Thielman’s book. All that can really be done here is touch on some of the figures in this whole discussion. Anyone who has read much of the exegetical works of John Calvin or Martin Luther will be familiar with the fact that Luther and Calvin are often quick to put an equation mark between the Roman Catholics of their day and the Jews or the Judaizers of the earlier New Testament era. It was a hermeneutical tool which allowed them to condemn the excesses of their opponents with a considerable degree of authority. In his tractate On the Jews and Their Lies (1543), for example, Luther assumes that the Jews always believed that the act of circumcision itself would save them. Like “the papists,” says Luther, they divorce an outward ritual from God’s Word and so believe that their own effort will make them pleasing to God. The law drives them, like “the barefoot friars,” not to the feet of God to beg for his mercy but to point boastfully to their own holiness and to claim that they possess such an excess of it “that they can use it to help others to get to heaven, and still retain a rich and abundant supply to sell.” Many other examples can be given. The Jews of Paul’s day and the Papists of Luther’s day are often considered one and the same. It was frequently assumed…that at least from the period of the restoration of the Jews to Israel under Ezra, the history of Judaism was a story of spiralling degeneracy into legalism, hypocrisy and lack of compassion. Similarly, when Protestant scholars discussed rabbinic Judaism they tended to assume that Paul’s polemic against Judaism, interpreted through the lens of Luther’s reaction against Roman Catholicism, provided a sound basis for systematizing the religion of the Mishnah, Talmud and related Jewish writings of a later era. Probably one of the most extreme examples of this kind of approach is found with a man named Ferdinand Weber. In 1880 Weber published a book called Jewish Theology on the Basis of the Talmud and Related Writings. Herein he summarized and systematized many passages from rabbinic writings; in doing so, he portrayed a stern God who appeared as a bookkeeper whose business it was to keep account of all one’s merits and demerits. According to Weber, rabbinic Judaism also knew of a “treasury of excess merits that could be shared with those who did not have enough”, and here too it was often “impossible to know just where one stood with God.” Weber’s work has not been without influence. It has been used extensively by W. Sanday and A. Headlam in their ICC Commentary on Romans, as well as in some of the works of R. Bultmann. In any case, this approach generally continued until around the beginning of this twentieth century. Significant criticisms were launched by the Jewish Reformer C. G. This section from a combination of Thielman in DJG and his book. Montefiore as well as a man who was neither a Jew nor a NT scholar, George Foot Moore. I refer you again to the summary of Thielman for details regarding their arguments. These men pointed to what has been called a “hermeneutical error” made already by the Reformers. They pleaded with scholars to read the Jewish writings on their own merit rather than through the glasses of Roman Catholic theology. Regrettably, it was a plea that largely fell on deaf ears. It was really not until 1977, when E.P. Sanders wrote his most significant work Paul and Palestinian Judaism: A Comparison of Patterns of Religion (Fortress), that scholarship really started paying attention. The aftermath of the Second World War as well as living in an age that is not receptive to any kind of racial bias may have had something to do with it. In any case, Sanders made his way through the most influential works of modern New Testament scholarship in order to show how they inappropriately discredited Judaism. He then embarks on a long journey through the Jewish Tannaitic literature (50 BC to 200 AD), the Qumran material, and the apocryphal and pseudepigraphal literature. According to Sanders then, the law was obeyed as a response to God’s gracious and redeeming work. God graciously saved his people, and they should respond to his grace in grateful and humble obedience. All the detailed regulations found in the Mishnah assume this covenantal context. Seldom in the history of New Testament scholarship has a single book drawn as much attention and caused such debate as this book of Sanders. The pleas of Montefiore and Moore were receiving attention as never before. The problem that all of this presents of course, is: if this is true of Judaism, what are we to make of the kind of Judaism that is encountered in the writing of the apostle Paul? And, if the Reformers and others were not careful enough in their interpretation of Paul, has our vision of Paul also been blurred because we have been looking through anti-Roman glasses? The answer that Sanders has presented to this problem was that Paul repeatedly reasoned backwards from the solution of faith in Christ to the human plight that this solution demanded. The point is that whereas Luther, for example, was ever so aware of his plight (his desperate need for salvation) before arriving at the solution of a God who justifies the ungodly, Sanders is convinced that Paul did not wander about in Judaism aware of some such burdensome plight. The plight really came to light, so to speak, only when the solution was provided in Christ. Paul’s logic seems to run like this: in Christ God has acted to save the world; therefore the world is in need of salvation; but God also gave the law; if Christ is given for salvation, it must follow that the law could not have been; is the law then against the purpose of God which has been revealed in Christ? No, it has the function of consigning everyone to sin so that everyone could be saved by God’s grace in Christ. Dunn believes that Sanders has erred somewhat in not emphasizing adequately what he calls the “social function” of the law in the New Testament era. At this time, the Jews saw the law as a sign of the position God graciously gave them and hence it served as a “badge” of their privileged position or, as Dunn likes to call it, a “boundary marker” between them and all others. Thus the issue for Paul never is and never was merit-based righteousness but it was racial exclusiveness. And for that matter, any kind of boundary-marker other than faith in Christ itself. So these then are two modern approaches to Paul. Another person who, if time permitted, would merit some attention would be Heikki Räisänen. This Finnish scholar agrees with Sanders’ viewpoint but then maintains that Paul has shifted his perspective a number of times, and ultimately is inconsistent. It is discouraging to note that this is where we end up with such approaches; the positive view on Judaism is taken as a given and then one seems to engage in all kinds of exegetical gymnastics to make Paul fit that picture. What should our position be regarding the views of Sanders and Dunn? There are a number of criticisms that can be brought forward at this point..
a) The Evidence: No Legalism? Sanders offers no explanation for—indeed, shows no awareness of—what looks like a fairly blatant view of self-salvation. Of course, it would be unfair to focus on these two verses at the expense of ignoring the genuine piety that characterizes so much of Ecclesiasticus. Yet the notion that one’s good deeds have efficacy over against one’s sins…does lie at the very root of legalism. This is of course only one small indication of the fact that despite his claim to be against bias, he appears to have read the evidence with a particular agenda in mind. A much more detailed evaluation can be found in chapter eight of D. A. Carson’s, Divine Sovereignty and Human Responsibility: Biblical Perspectives in Tension. In his survey, Carson concludes that while Sanders is generous in his evaluation of the Tannaitic period, he is substantially correct; however Carson notes and shows from the evidence that while some merit theology is present in the Tannaitic period, there is a drift towards much more of this merit theology in the later rabbinic material. While God’s sovereignty is emphasized, there is also ironically a tendency to “magnify the man”; the result is that one cannot be generous anymore about the later rabbinic writings. The sovereign God is no longer sovereign over the area of salvation. Much more work needs to be done in this regard but it is likely that Sanders’ presentation of Judaism will increasingly be found wanting and one-sided. The fact that there is such a mass of material here and so much variety in the writings suggests that it is possible that one who wants to find elements of grace in rabbinic writings will be able to find them, but those who seek legalistic elements will be able to uncover those as well. At the same time, however, one might ask the question whether there is not more than one way to test for legalism. Sanders seeks to ward it off with his references to “getting in” and “staying in.” But there are other indications of legalism. Sanders tries to defend this in all kinds of ways, but the fact is that Paul would have most emphatically rejected any and all such argumentation. There is, secondly, the sheer mass of rabbinic material. The fact is, that “the sheer number and detail of laws which are codified in the Mishnah betray the presence of legalism.” Just as the vast tangle of today’s legal system brings about the need for the ordinary citizen to hire a lawyer in order to interpret and assist him through the legal jungle, so it goes here. Nonetheless, the vast quantity of laws in the Mishnah and the minutiae contained therein enshrine legalism. When people begin to stress complex and detailed prescriptions for obedience, then the primacy of grace is threatened, even if the specific laws are viewed as a divine gift. There is, thirdly, a failure to stress God’s role. Sanders says at one point: “Very seldom is God’s role in the covenant directly discussed. It is assumed so thoroughly that it need not be mentioned.” While willing to grant this to a degree, Schreiner points out that when there is a failure to mention grace and the covenant but at the same time no failure to mention prescriptions of the law, “one has a recipe for legalism.” Any theology that claims to stress God’s grace but rarely mentions it and that elaborates human responsibility in detail inevitably becomes legalistic in practice, if not theory. This principle applies to rabbinic Judaism and to Christian churches. A church outwardly lauding grace as primary and fundamental may practice the most virulent legalism. It is essential to note, however, that this kind of legalism is hardly the exclusive property of Judaism or medieval Christianity. On the contrary, it belongs to the heart of sin in its universality; indeed legalism is but the human cry for personal autonomy. Doing things our way as distinct from trusting God’s power is illustrated just as clearly in modern evangelicalism as it is in the narrative of the wilderness wanderings. The inclination toward self-righteousness is thus not a unique Jewish problem: it is endemic to the human condition, and even the most deeply sanctified believer is vulnerable to its power. Another criticism launched by Silva, is the fact that Sanders seems to make no allowance for the possibility that in early, medieval or modern Judaism, there may indeed have been lay people or others who perceived salvation along legalistic lines. Silva quotes from Ellis Rivkin (a modern scholar who has made a significant contribution to the question who the Pharisees were); Rivkin refers to his earlier life in terms quite similar to Luther’s description of his own “plight”. On the unerring scales of God’s justice, would my righteousness offset my sinfulness and tip the scales to eternal life, or would the heavy weight of this or that sin, alone or in combination, bring the scales down on the side of eternal punishment? I oscillated between the ecstasy of the Law fulfilled and the agony lest, frail, finite, and impulse-ridden, I would fall short of what the Law demanded of me. That raises the larger question: is Judaism necessarily as monolithic as modern scholars seem to make it appear? From much of the literature one gets the impression that either all of Judaism — as it is presented in the Jewish writings, and represented anywhere in the New Testament—is legalistic or none of it is. “Either the Pharisees were hypocritical legalists who consciously sought to bribe God with their self-righteousness or they were not affected by legalism in any significant way.” But that is clearly a false dilemma. Is it not possible that there were various shades of legalism, even within Pharisaism? Must we presume that Pharisees were always alike—whether they are found in Jerusalem or in Galilee? Is the Lord Jesus, for instance, not more sympathetic to Nicodemus (John 3) than to those whom he opposes in Matthew 23? Similarly with the writings of the apostle Paul, must we suppose that his opponents were either all legalistic or not legalistic at all, without any possibility of shades in between? In this regard, it is noteworthy that the issues that Dunn raises are, more often than not, also presented as a dilemma. If we, for argument’s sake, might be willing later to allow that there is something to Dunn’s view, does it have to be either-or here? Why is it always presented as if Paul is either opposing legalism or he is opposing exclusivism? Are these necessarily mutually exclusive? A welcome voice in this regard is being raised by Bruce Chilton. In his article on “Judaism,” he speaks about a “radical pluralization” of Judaism. In a book that he authored together with Jacob Neusner, it is argued that there was not one Judaism in and before the New Testament era but many, Christianity being one of them, “the Mishnah’s Judaism” being another. It seems to me that this is a move in the right direction. There are few movements in which everyone is consistently the same everywhere. (Canadian Reformed Churches, for example?!). While tendencies towards legalism (and exclusivism?) reside in the hearts of all, by the grace of God, some will be spared from this blindness more than others. Obviously then, despite the flurry of excitement and discussion that Sanders has caused, and the fact that much of this discussion has been helpful, there is much that must be rejected. The use of works by advocates of this “New Perspective” will need to be read very critically. What about the ideas of James Dunn, then? Is it true that there is no indication of seeking salvation in a legalistic fashion anywhere in Paul? Just boundary markers instead? Weighing through all the writings of Dunn and working out an extensive critique is obviously a bigger task than you or I have time for today, but a number of critical comments can be made. It will be apparent that Dunn wants to restrict the phrase “works of Law” (e[rgwn novmou) to a kind of technical term used specifically to these identity markers. It is doubtful however whether that can be sustained. Both D. J. Moo and S. Westerholm have also argued very persuasively that the expression “works” (e[rga) in Paul refers to “deeds that are performed,” and thus “works of Law” signifies the “deeds” or “actions” demanded by the Mosaic Law. They find proof in Romans 3-4 where “works of Law” and “works” cannot be distinguished; especially in Romans 4:1-5 where Paul says that Abraham was not justified by his “works” (Rom 4:2) nor by “working” (Rom 4:4-5), these can hardly be limited to “identity markers” since Abraham lived before the arrival of the Mosaic Law. Other weaknesses in Dunn’s theory are apparent as well. His work “Works of the Law and the Curse of the Law (Gal.3:10-14)” is an article he wrote in response to critics as a crucial test-case. But one of the reasons he fails to be convincing is because he entirely seems to overlook the fact that, while the quotation from Deut.27 is central to the passage, the works to which Deut. 27 refers, the sins that bring down the curse of the covenant, are not limited to circumcision, sabbath, etc., but there are references to idols (15), dishonoring father or mother (16), lieing with one’s father’s wife (20) or slaying one’s neighbor in secret (24). When one reads this, one wonders: even if the issue is exclusivism, is it not at one and the same time legalism? Dunn might respond: yes, but these are not Jews but Christians whom Paul is opposing. But to that, we would need to respond: yes, but the influence in this regard surely is from Judaism. And at bottom, it is still legalism that is at issue. One more argument that should be considered for the position that Paul was indeed arguing against legalism has to do with the frequent references in Paul’s writings to boasting (Rom.3:27-28; 4:1-5). Those references make little sense if they are nothing more than a matter of nationalism (or dietary laws, or sabbath observance), but if they have to do with pride in one’s performance — something tempting to every human being — Paul’s major point has great significance: glory and praise needs to be heaped upon the one and only God alone! Equivalent defining issues within the history of Christianity have included believers’ baptism, speaking in tongues, or apartheid. Today we might think of issues like abortion, women priests, scriptural inerrancy, or papal infallibility. Here we see the practical consequences of following Dunn’s exegesis. Just as Paul fought against all boundaries and exclusivism, so the Christian church must oppose any and every boundary! Whether they are boundaries given by God’s command does not matter (circumcision was too! ); Paul, and thus God, is against any notion of exclusivity. Those who have opposed one hermeneutical jump are now making another! Titus 3:4-7, and so many more of the apostle’s words? The problem in much of this is the sweeping positions Sanders and Dunn seem to adopt. In the time available to me, I have not managed to exegete all the passages that come up for discussion here, but I am willing to grant that it is possible that sometimes we are seeing legalism where we shouldn’t or that sometimes we should be seeing exclusivism when we don’t. We can learn from the voices of Sanders and Dunn as we consider them. But the problem is that for Sanders and Dunn it is never legalism that Paul is up against, and the problem with Dunn specifically is that it is always exlusivism that Paul is opposing. d) What about Luther and Calvin? The question that persists as we come full circle is to what degree Luther and Calvin are still trustworthy guides to Paul. Now, to me there is no doubt that Sanders has issued a commendable warning. The rabbinic sources need to be read on their own merit. If we are going to read Luther and Calvin, we will do well to be aware of this hermeneutical jump which they frequently make. But let there be no doubt that Luther and Calvin have much to teach us. Students who want to know how a rabbinic Jew perceived humanity’s place in God’s world will read Paul with caution and Luther not at all. On the other hand, students who want to understand Paul but feel they have nothing to learn from a Martin Luther should consider a career in metallurgy. Exegesis is learned from the masters. Especially this exercise in reading some modern authors reinforces the thought that to really understand Paul on this and other points, we continue to do well to learn from the masters of the Reformation era. Westerholm himself advocates reading Paul with some aid from Luther. He argues as a result that in the Old Testament, and thus in Jewish “soteriology” works do play some role. For support, he refers to passages in which Israel is promised “life” if they will do the commandments of the law (Lev. 18:5; Deut 4:1; 5:33; 6:24-25, etc. Overagainst this view, he suggests, Paul, as Luther saw it, insisted that human activity played no role in salvation at all. Frank Thielman and Timo Eskolaseem to steer us in a direction more similar to that of Calvin. Clearly, this master will teach us more than many a modern. The church has really not been that far off the mark. E. P. Sanders has rightly sounded a warning concerning the practice of some (e.g. F. Weber) to read the rabbinical writings, the Scriptures, and other writings of that time in such a way that the issues involved in the debates of the Reformation about justification by grace/works are imposed upon the Jews. To read them today with the presupposition that they were all legalists is inappropriate. Rabbinical writings need to be allowed to speak for themselves. Sanders has shown that the principles of grace were often alive in Judaism. The service of the Lord and the study of Scripture was also a joy and delight for many Jews in and before the New Testament period. It has been shown however (M. Silva, D.A. Carson) that Sanders has often attempted to put the rabbinic writings in the best possible light, frequently overlooking aspects wherein a theology of merit is present. He does not adequately emphasize either that this merit theology, present at times in Tannaitic writings (50 BC – 200 AD), becomes increasingly predominant in later Amoraic writings (220 – 500 AD). It should not be overlooked that the sheer volume and vast number of details and laws in the Mishnah and subsequent Talmuds tend towards legalism. In this whole discussion, it should not be forgotten that legalism is not the exclusive property of any Jewish or Christian group. An inclination towards legalism is part of the fallen human condition. In this debate too, false dilemmas need to be avoided. The choice is not: either all of Judaism was legalistic or none of it was. There is the possibility that some individuals/groups/areas were more legalistic than others. Likewise, there is not a single Judaism behind all the documents, nor should we presume that the opponents of the Lord Jesus were necessarily the same as the opponents of Paul on this point or that Paul’s opponents were always of the same mindset. It is to be regretted that Sanders and others have made this “new look” re a non-legalistic Judaism decisive and normative. Whenever the Scriptures seem to present a contrary picture, it is the Scriptures rather than the “new look” on Judaism that must be adjusted. This is leading to a “New Perspective on Paul” in which the writings of Paul are being reinterpreted in a way which, more often than not, is regrettable and wrong. The subsequent shift of the New Perspective by James D. G. Dunn re “works of the law” is particularly lamentable. a) His reinterpretation of “works of the law” in Romans and Galatians as “boundary markers” of Judaism which Paul rejects is contrary to the significance that this phrase has had in the OT, in Qumran writings, and must necessarily have in Paul (Timo Eskola). b) The implication that Paul is opposing exclusivism in every instance rather than legalism must necessarily involve a further reinterpretation of Paul which jeopardizes the principles of justification by faith through grace alone (Westerholm, Thielman). c) Dunn’s conclusion that Christianity must similarly oppose all exclusivism (re Lord’s Supper practices, believer’s baptism etc) is unScriptural and dangerous for the life of the churches.9. 9. While it is important to be mindful regarding the point mentioned in #1 above, the writings of the Reformers remain very significant tools for the understanding of the apostle Paul (Westerholm, Thielman). 10. 10. “Traditional Reformed theology can learn and appropriate a great deal from recent Pauline research, but it need not fear the dissolution of one of its central tenets, sola fide” (Silva). E. P. Sanders, Paul and Palestinian Judaism: A Comparison of Patterns of Religion. Fortress Press, 1977. James D.G. Dunn, “The New Perspective on Paul” Jesus, Paul, and the Law: Studies in Mark and Galatians Westminster/John Know Press, 1990. D. J. Moo, “Law, Works of the Law , and Legalism in Paul” Westminster Theological Journal (1983) 73-100. Thomas R. Schreiner The Law and its Fulfillment: a Pauline Theology of Law Baker, 1993. Moisés Silva, “The Law and Christianity: Dunn’s New Synthesis” Westminster Theological Journal (1991) 339-353. S. Westerholm, Israel’s Law and the Church’s Faith: Paul and his Recent Interpreters Eerdmans, 1988. Address presented to ministers of the Canadian Reformed Churches at the Chinook Study Center’s Ministerial Conference in Coaldale, Alberta and to the Minister’s Conference in Hamilton, Ontario in May 1999. Thomas R. Schreiner, “Reading Romans Theologically: A Review Article” JETS 41/4 644. I am referring here to comments made in “On Being Reformed: An Open letter” in Information: A Newspaper for the Reformed Home 7/3 (Nov 28, 1998) where the charge has been made that “an attitude of ‘exclusivism’ toward other Christians.” From the response of Dr. J. Visscher to this charge (“Responding to an Open Letter IV” Information 7/6 (February 5, 1999), it is apparent that the writings of J.D.G. Dunn are behind this viewpoint to some degree. Paul and the Law (IVP, 1994) 14 – 47. A briefer survey is found in Thomas R. Schreiner’s The Law and Its Fulfillment: A Pauline Theology of Law (Baker, 1993) 13 – 31. For a more detailed review of the various positions, S. Westerholm’s Israel’s Law and the Church Faith: Paul and his Recent Interpreters (Eerdmans, 1988) is recommended; this significant work is in the process of being revised and updated. See Frank Thielman, Paul and the Law: A Contextual Approach, 23. The references in Luther’s Works are to LW 47:172; cf. 47:159-76. Commentaries on the Epistles of Paul the Apostle to the Philippians, Colossians, and Thessalonians. Translated by John Pringle. (Baker, 1977) 92. Ibid., 96. These examples from Luther and Calvin are supplied by Thielman in Paul and the Law, 23-24. F. Thielman, “Law,” Dictionary of Paul and his Letters. Edited by G. F. Hawthorne, R. P. Martin. (InterVarsity Press, 1993) 530. Paul and the Law, 25. In “Rabbinic Judaism and the Epistles of St. Paul” Jewish Quarterly Review 13 (1900-1901) 161-217 and Judaism and St Paul: Two Essays (M.Goschen, 1914). His three volume work, Judaism in the First Centuries of the Christian Era: the Age of Tannaim has recently been reprinted (Hendrickson, 1997) and is still a valuable guide to Tannaitic Judaism (50 BC to 200 A.D.). Paul and Palestinian Judaism, (Fortress, 1977) 75. In response to criticisms, Sanders later wrote: Paul, the Law and the Jewish People (Fortress, 1983). Other works in which his views are defended are Jewish Law from Jesus to the Mishnah: Five Studies (SCM/Trinity, 1990); Paul: Past Master (Oxford, 1991). Paul and the Law, 31. Paul and Palestinian Judaism, 429-556. Paul, the Law and the Jewish People, 156; cf. 35. As Thielman summarizes Sanders in Paul and the Law, 35 (cf Sanders, Paul and Palestinian Judaism, 482-84, 492-3). Paul and Palestinian Judaism, 484-5. Thielman, Paul and the Law, 35 ( cf. Paul and Palestinian Judaism, 485-90, 509-10). Paul and Palestinian Judaism, 552. See J.D.G. Dunn, “The New Perspective on Paul,” Jesus, Paul and the Law: Studies in Mark and Galatians (Westminster/John Knox Press, 1990) 183-214. Cf. in the same book “Works of the Law and the Curse of the Law (Gal.3:10-14) where Dunn says “‘works of the law’ is, then, another way of saying ‘covenantal nomism’ – that which characterizes ‘being in’ the covenant and not simply ‘getting into’ the covenant (as Sanders himself put it)” 220. “Works of the Law and the Curse of the Law (Gal.3:10-14), Jesus, Paul and the Law: Studies in Mark and Galatians 220. Räisänen view are discussed by S. Westerholm in Israel’s Law and the Church’s Faith, 93-102. Readers will also be interested in the dissertation written under Dr. J. van Bruggen by T. E. van Spanje, Inconsistentie bij Paulus? Een confrontatie met het werk van Heikki Räisänen (Kok, 1996). “The Law and Christianity: Dunn’s New Synthesis” Westminster Theological Journal Volume 53. 1991. 339-353. See the comments of N.T. Wright where he says that E. P. Sanders is not “a sworn enemy of Christian truth or faith” but a man who is against all prejudice (see S. Neill and N.T. Wright, Interpretation of the New Testament, (Oxford University Press, 1988) 391-2). Elsewhere, Sanders says: “I have been engaged for some years in the effort to free history and exegesis from the control of theology; that is, from being obligated to come to certain conclusions which are predetermined by theological commitment”(Jesus and Judaism (SCM Press, 1985) 333-4). (Baker, 1994) 84-109. References to other reviews of Sanders’ approach can be found in Schreiner (The Law and its Fulfillment 114-21) and Eskola (Theodicy and Predestination in Pauline Soteriology (Mohr Siebeck, 1998) 52n1). Carson, Divine Sovereignty, 106, 109. See the striking example re Abraham on p. 107. Schreiner, The Law and its Fulfillment, 117. Schreiner, The Law and its Fulfillment, 116. Sanders, Paul and Palestinian Judaism, 82. Theodicy and Predestination in Pauline Soteriology (Mohr Siebeck, 1998) 56. Eskola actually writes that Sanders has given “nomism…a new status but from the context it is evident that he is suggesting that “covenant nomism” gives legalism a new status. That is quite a charge, but by email correspondence I have confirmed that this is what Eskola’s position. “The Law and Christianity: Dunn’s New Synthesis,” 349. A Hidden Revolution: the Pharisees’ Search for the Kingdom Within (Nashville: Abingdon (1978) 22. “The Law and Christianity: Dunn’s New Synthesis,” 350-1. Of interest here is the discussion about the possibility of “soft” and “hard legaism”; for some of the discussion on this point, see S. Westerholm, Israel’s Law and the Church’s Faith, 132-4. Silva notes one occasion where Dunn is more careful, but rightly maintains that this is exceptional (Silva, 351). In Dictionary of Jesus and the Gospels (IVP, 1992), 400f. Judaism in the New Testament: Practices and Beliefs (Routledge, 1995) 31. Timo Eskola makes similar suggestions in Theodicy and Predestination, 56. That this is becoming a more standard view is also evident from the article on “Judaism” by J. Andrew Overman and William Scott Green in the Anchor Bible Dictionary III (Doubleday, 1992) 1037-54. It should be noted as well that despite my considerable appreciation for the works of N. T. Wright (especially The New Testament and the People of God and Jesus and the Victory of God in the Fortress series called Christian Origins and the Question of God), Wright is also an adherent of the New Perspective, as is apparent from the quotations cited by S. Westerholm in Israel’s Law and the Church’s Faith., 145n8. Probleme paulinischer Theologie (Kohlhammer, n.d.). Dunn refers to Lohmmeyer and Tyson in “Works of the Law and Curse of the Law (Gal.3:10-14),” Jesus, Paul and the Law (Westminster/John Knox Press, 1990) 220. JBL 92 (1973) 424-425. It was especially Tyson who identified the works of the law to such things as circumcision and dietary laws. Eskola, Theodicy and Predestination, 212. Eskola, Theodicy and Predestination, 213. Dunn took the opposite view in “Works of the Law and the Curse of the Law,” 220 and in “4QMMT and Galatians” New Testament Studies 43/7 (1997) 147-153. Settling the issue is obviously not easily done, but it should be noted that one might expect the phrase to have more of a boundary-marker function since 4QMMT is believed to be a letter written by the Essenes to their opponents in Jerusalem regarding their distinctives. Wisd. 6:3-4; cf. 12:4,19; Sirach 10:6; 11:20-21; 15:19. Jesus, Paul and the Law: Studies in Mark and Galatians 215-41. The point that Dunn tries to make is that “the curse which was removed by Christ’s death was the curse which had previously prevented that blessing from reaching the Gentiles, the curse of a wrong understanding of the law” (229). Israel’s Law and the Church’s Faith, 119. Westerholm also offers other objections to Dunn’s theories in “Sinai as Viewed from Damascus: Paul’s Reevaluation of the Mosaic Law” The Road to Damascus: the Impact of Paul’s Conversion on His Life, Thought, and Ministry. Edited by R. N. Longenecker. (Eerdmans, 1997) 147-165. The Epistle to the Galatians. Black’s New Testament Commentary. (Hendrickson, 1993) 172. “The New Perspective on Paul,” Jesus, Paul and the Law 193. The Theology of Paul the Apostle 358. This approach gets worked out to some degree in Dunn’s Christian Liberty: A New Testament Perspective (Eerdmans, 1993). Israel’s Law and the Church’s Faith, 173. See Israel’s Law and the Church’s Faith, 146-7. See the comments Thielman makes in Paul and the Law: A Contextual Approach 243-5. He suggests that “Perhaps the present work can stand as a modest correction to Westerholm’s fine achievement” (245). Another work worthy of note is I. John Hesselink’s revised dissertation Calvin’s Concept of the Law (Pickwick Publications, 1992). Eskola suggests the these texts that Westerholm quotes re life above are not speaking about “eschatological salvation” but about life today Theodicy and Predestination, 54. On a related point, it is important to view recent discussion about the relationship between the Lord Jesus and the Pharisees in the light of these new views on Judaism and the law. To downplay the conflict is inappropriate as the Gospels and Paul are reliable sources of what transpired in the first century.